Who is alive among the Martyrs enriching the celestial homeland. 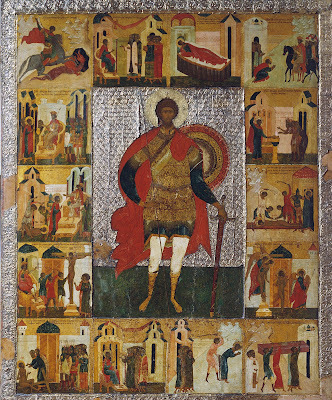 * The Holy Great Martyr Theodore Stratelates suffered for Christ in Heraclea on February 8, 319. 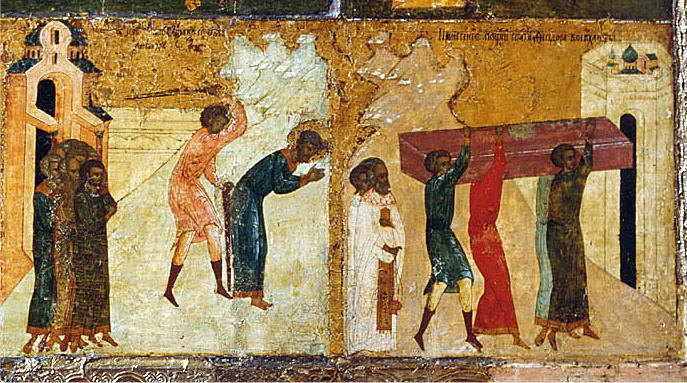 At the time of his sufferings Saint Theodore ordered his servant and biographer Abgar to bury his body on the estate of his parents in Euchaita. The transfer of his relics took place on June 8, 319. With thy true strategy, O Trophy-bearer, thou wast an illustrious general of the Heavenly King. Armed with the weapons of faith, thou didst annihilate hordes of demons. O victorious Athlete Theodore, with faith we call thee blessed. Though lying as dead in thy holy reliquary thou art enjoying eternal life. Thou dost pour forth a fountain of gifts for those who venerate thy relics, and seek thy help, O Theodore, God the Word's commander.